There is one thing that I have come to realize is that you will never stay on top of life. There will always be something that needs to be done, whether it is a pile of laundry, dishes, craft, organizing, or repairs. How many of us have caught ourselves saying, “I can’t do that, I have too much stuff I need to get done!”? When I catch myself saying this I have to tell myself to backup and say, “Never mind, IT WILL STILL BE THERE TOMORROW!”. Those piles, and unfinished items aren’t going anywhere. Your kids however are growing up everyday, your relationships with your family and friends are not getting any younger. Now, I’m not saying never clean your house, or never get those projects done. I’m leaning more towards the work smarter not harder philosophy. Cleaning your house could be a full time job in and of itself if you let it. 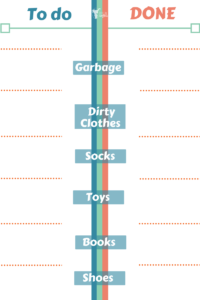 Lets face it mamas, we will never be on top of the mess in our homes. There will always be something to clean. Having said this, my husband is a huge advocate in teaching our children to clean up after themselves. At times I find it easier to do it myself. I know, not the smartest thing. There are days when I just don’t want to fight my kids to get things cleaned up. 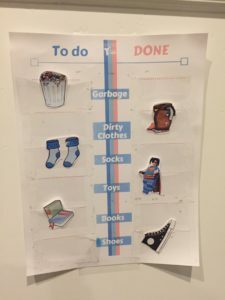 I have come up with a simple cleaning method that has helped my boys to clean their rooms better. Its still not mama perfect, but compared to the piles of trash, dirty clothes, food and who knows what else rotting in the back corner of their closet, it works pretty good. The key to this method is one thing at a time. I now give my boys a garbage sack and say, “BRING THIS BACK FULL! !” This prevents that pile of trash to be pushed into the back of their closet!! Each one of my boys has a printable as shown above. They are in charge of these items in their rooms. This printable below has the images for a boy or a girl. 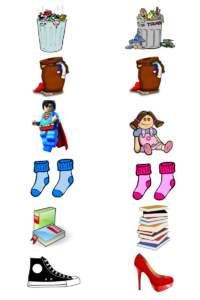 Simply place the images on the TO DO side, and have your child move it to the DONE side when it is accomplished. There are a couple ways you can put this printable together. 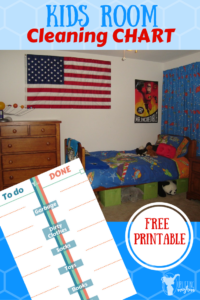 You can laminate both above printables and then use tape to stick the images onto the laminate. The laminate will help it last longer and will prevent those little tape tears. (Laminators are cheap, and so useful to have around the house. Here is one I found for $14.00 and here is a higher end one that is $32.00. Reviews are great on both! Another way is to get a clear sheet protector like these. Cut this sheet up into little rectangles, approximately 1 inch by 2 inch (You may need to adjust it accordingly). Get some double stick tape and place that tape along the 2 short ends and the bottom long end of the plastic. Place the piece of plastic so that the open top is lined up with the dotted line on the printable. This creates a little clear pocket. I prefer this way so the pieces don’t fall off, and you can still see the image through the plastic. It is a little tedious cutting and taping each little rectangle on, but in the end I prefer this way. I don’t lose the pieces as fast and it is easy for the kids to do. I hope this helps keep your kid’s room cleaner without having to be there doing the cleaning for them. Good Luck! For more great stuff from Uplifting Mayhem, subscribe to receive weekly emails of the latest!